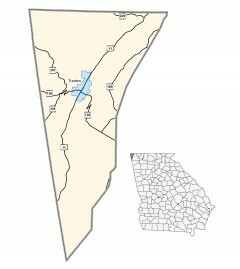 Dade County, in Georgia’s extreme northwestern corner, was established in 1837, a year before the federal government began removing the original inhabitants, the Cherokee Indians. Carved from western Walker County, it was the 91st county created in the state. Dade County was named for a Virginian, Major Francis Langhorne Dade, who was killed in 1835 while fighting the Seminoles. Trenton, the county seat, was named after the city in New Jersey.